The iPad seems unstoppable. Pre-orders for the new iPad sold out in less than a week. But it’s not just consumers that are interested; eighty-four percent of businesses prefer the iPad over its competitors, according to a survey by ChangeWave Research. With its current lead in the market, momentum could keep demand high for a number of reasons. The survey, done in February 2012 before the release of the new iPad, and released Tuesday, found that one in five businesses was planning to buy a tablet in the second quarter of the year. Demand for the iPad increased 7 percent since the last survey from November, while all eight competing products in the survey saw a decrease. In an informal PC World survey last week, 67 percent of respondents said they were likely to purchase an iPad, while only 34 percent had no such plans. Of those planning to buy the tablet, 8 percent were just as likely to buy either the new iPad or the iPad 2, but 48 percent wanted the new iPad--suggesting that demand could grow even higher. Here are three reasons why the interest in iPad by businesses will continue an upward climb. Being first to market with an app store, Apple discovered the importance of apps to a mobile device ecosystem. The number of quality apps available for a device is an important factor in choosing a mobile platform. Apple leads with over 600,000 apps available, and over 25 billion have sold thus far. Developers of business apps are most likely to invest their time in creating apps for the biggest business platform, which the iPad clearly offers. Businesses will buy the device that runs the software they need, so as the apps continue to come, so will sales. 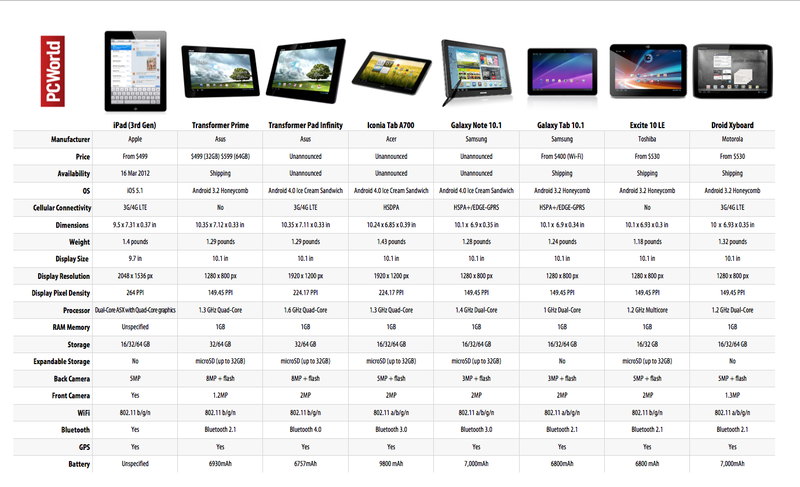 Compare the iPad against popular Android tablets. In the same way that app developers write for the leading market, hardware developers create products for the most popular devices. In the consumer market, this can be seen by the number of speaker docking stations that are iPod/iPhone compatible, while very few are available for other platforms. As more iPads find their way into businesses, expect hardware accessories that are specific to iPads to proliferate. From Point-of-Sale (POS) stands to bar-code scanners to medical devices, businesses will find it easier to extend the functionality of an iPad than for competing devices, and that will drive sales. There was a saying in the 1970s, "No one ever got fired for buying IBM." The implication was that at the time, IBM was a safe bet, a popular choice, and that one couldn’t go wrong by selecting it. The same could now be said about Apple, considering the lead it holds in the tablet market. There is safety in numbers. While HP’s TouchPad is dead, and survival of RIM’s PlayBook seems in question, there is no doubt the iPad will continue to be around. Businesses want the reassurance that their products will continue to be supported, and Apple’s currently in the strongest position to provide that. All of the reasons above boil down to numbers. Apple has them, and it will fight to hold on to its advantage. Can the iPad remain the top tablet forever? The most likely way for other tablet makers to compete is on cost. If competitors could offer similar features but at a significant savings, some businesses would be interested and a market shift could begin. Unfortunately for them, however, Apple holds numbers here as well, paying less for its parts due to the high volume it can promise. Though this makes selecting a tablet easy, stronger competition would likely provide better options for businesses to select from. How can the iPad’s competition stand out and become noticed by businesses?